Is the Internet wrong for being angered by this tired mom? I can only imagine how exhausting it must be to be a parent? I'm not a father myself, but I have many friends and family who have kids and they are constantly telling me how tiring and exhausting it is to raise a little one. There's this picture which is doing the rounds on social media showing a mom with her baby lying gently on a floor in an airport. It seems there's a lot more to the picture which quickly viral. 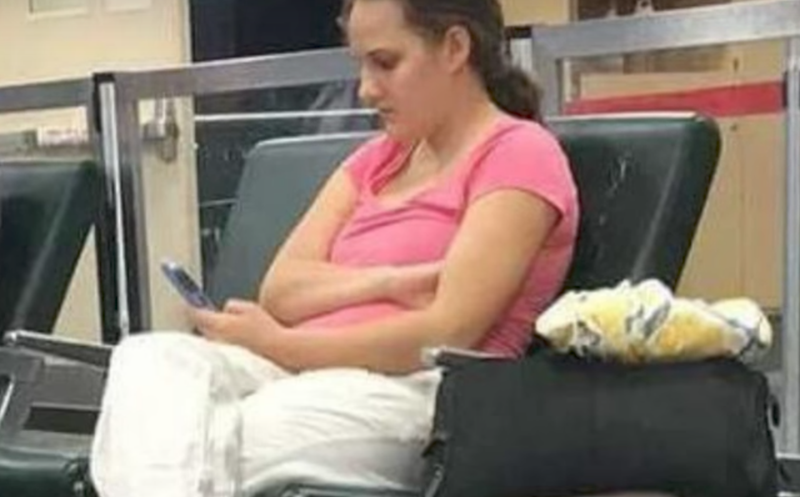 According to Daily Star, the picture was taken by a fellow passenger at a Colorado Airport who saw the woman on her phone while her baby lay on the floor. It was shared on social media and since then the mom, Molly, has been shamed for her parenting skills. But Molly has since hit back at the shocking criticism, saying she's feeling that her privacy has been violated. After their flight was delayed and re-booked so many times, they ended up spending 20 hours in the airport. Molly, whose arms were tired, placed her baby daughter onto the ground for a stretch. Being a part-time nurse and having recently started work on a labour floor, Molly was terrified that her co-workers or boss would see the photo. Personally, although I cannot relate to being a parent, I do know that parenting is hard work and sometimes we will never truly understand the exhaustion and toll mothers have to experience while raising their little ones. What do you think - is this picture really that bad or do you think that people are overreacting and they need to give this mom a break? Also read: Suffering from ‘mom guilt’? Join the club!